Accounting CS integrates with one of SwipeClock's cloud-based time and attendance solutions, TimeWorksPlus, which can help to simplify time tracking. If your firm currently works with clients using SwipeClock, you can take advantage of this integration and avoid the need to manually import or export information between Accounting CS and SwipeClock TimeWorksPlus. This overview steps you through the process of starting service with SwipeClock's TimeWorksPlus and setting up your client and employee records for SwipeClock's TimeWorksPlus import. You may also want to view the Setting up integration with SwipeClock video before you begin. The prerequisites to integrating Accounting CS and TimeWorksPlus are noted below. It is imperative to follow these steps before setting up payroll processing in TimeWorksPlus. To set up service with SwipeClock, contact their sales staff directly by phone, email, or on the Web. Follow these steps to grant permission to Accounting CS to access the firm's client information in TimeWorksPlus. Choose Setup > Firm Information > Firm and click the Preferences tab. In the SwipeClock Integration section, click the Ellipsis button next to the SwipeClock partner login credentials field. In the SwipeClock Partner Login Credentials dialog, complete the Accountant ID field and the Accountant Secret field with the information provided via the TimeWorksPlus application. Click OK to close the dialog, and then click Enter to save your changes. Highlight the existing client name and click Edit, or add the new client as described in the Entering basic client information article. 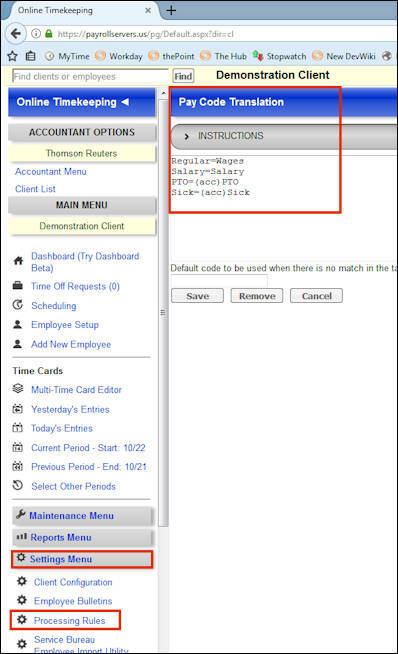 Click the Payroll Information tab and, in the Employee Data Integration section, mark the SwipeClock checkbox. Click the Ellipsis button next to the checkbox, and in the SwipeClock dialog, enter the Site ID (which is provided in the TimeWorksPlus application) and the File format name (which, in most cases, should be csxml2). If the csxml2 file format does not work for your client, you'll need to work with SwipeClock support to have them provide a custom format for you. Accounting CS transfers all employee setup information to TimeWorksPlus for SwipeClock's TimeWorksPlus clients. However, if you want only to import time clock files from TimeWorksPlus into Accounting CS, mark the Import time clock files only checkbox. Click OK to save your settings. Click the Ellipsis button next to the Payroll Schedules field. In the Payroll Schedules dialog, select a payroll schedule and then click the Edit button. In the Time Entry Method section, choose the Import option and then select SwipeClock in the Source drop-down list. Verify that the period begin dates and period end dates of the payroll schedule match the pay periods in SwipeClock. Click Enter and Done to close the dialog, and then click Enter to save the client information. Set up your employee as usual, as described in the Entering basic employee information article. If the employee uses multiple payroll schedules, select the TimeWorksPlus pay schedule in the Primary payroll schedule field in the Main tab. You can select other pay schedules in the Alternate payroll schedule field. On the Payroll Items tab, make sure that each employee has at least one active pay item set up. Employees must be set up in Accounting CS prior to being imported to TimeWorksPlus. The Employee ID is the unique identifier used to match employee records between Accounting CS and TimeWorksPlus. Changing or re-using an Employee ID could cause time to be associated with the incorrect employee, or possibly cause a duplicate employee to display in TimeWorksPlus. If the client creates a new employee record in TimeWorksPlus, that same employee record must be manually created in Accounting CS as well. Both records must use the same employee ID number to establish the connection and enable future synchronization. Changes to employee information must be made in Accounting CS, and will then transfer to TimeWorksPlus. Employee information changed in TimeWorksPlus will not transfer back to Accounting CS. Prior to importing time clock information from TimeWorksPlus, you'll need to make sure that your payroll items and accruable benefits match. Follow these steps in the TimeWorksPlus application. Choose Settings menu > Processing Rules and then choose the Processing option. In the Pay Code Translation pane, map your TimeWorksPlus payroll items and accruable benefits to those that you want to use in Accounting CS. Show me. When information is saved in the Setup > Employees screen, Accounting CS sends it to TimeWorksPlus automatically. The following table provides details about which fields in Accounting CS correlate to which fields in SwipeClock when that data is sent. If you have completed all of the setup steps detailed above, Accounting CS retrieves time clock data from TimeWorksPlus, based on the period beginning and ending dates, when you process payroll checks for TimeWorksPlusclients. We recommend that you verify that employee pay rates are up to date and correct in Accounting CS before you retrieve the timeclock information. If there are changes in employee information (rates, addresses, etc.) they must be made in Accounting CS and then that information will transfer correctly into TimeWorksPlus. In the Payroll schedule field, select the applicable schedule from the drop-down list. The Time Clock Entry Import dialog opens automatically and retrieves the data from TimeWorksPlus based on the current pay period. Accept or enter any necessary rate changes on the Rate Changes tab, review the time that has been retrieved on the Time Clock Entry Detail tab, print the details from each tab if you choose to, and then click the Continue button to proceed with the import. New payroll items and accruable benefit items can be added only in Accounting CS. TimeWorksPlus does not currently support the import of deduction items. However, any deduction items that you set up for an employee in Accounting CS will be calculated on payroll checks after time entry is imported from TimeWorksPlus. You will need to make any manual amount adjustments to the deduction items in Accounting CS. To avoid problems with synchronization between Accounting CS and TimeWorksPlus, employees should be added only in Accounting CS, and then imported to TimeWorksPlus. Additionally, employees should not be deleted, but rather set as inactive. The Employee ID is the unique identifier used to match employee records between Accounting CS and TimeWorksPlus. If you need to change an employee ID, You must make this change in Accounting CS and let the integration automatically update the employee ID in TimeWorksPlus to match. If the employee ID is changed in TimeWorksPlus first, that change does NOT transfer back to Accounting CS. Therefore, the next time Accounting CS sends the employee’s information to TimeWorksPlus, it will use the original ID. Because the old ID no longer exist in TimeWorksPlus, it creates a new, duplicate employee using the old ID. If you receive this message when trying to import time from TimeWorksPlus into Accounting CS, this means that hours were entered in a Location/Department distribution for an employee in TimeWorksPlus, but that Location/Department distribution is no longer active on the employee in Accounting CS. To correct this issue you will need to cancel the batch, go into the Setup > Employees screen, select the employee, and verify that all of the Location/Department combinations that were used in TimeWorksPlus are still active on the employee. If hours entered for a particular employee are not importing from TimeWorksPlus to Accounting CS, it could be because the description for the payroll item is not an exact match in each application. In Accounting CS, choose Setup > Payroll Items and make sure that the description in the Description field in the Main tab matches the description for that payroll item in the Client Configuration screen of TimeWorksPlus. TimeWorksPlus data is not importing to Accounting CS for certain payroll items. If data for particular payroll items is not importing from TimeWorksPlus to Accounting CS, it could be because the description for the payroll item is not an exact match in each application. In Accounting CS, choose Setup > Payroll Items and make sure that the description in the Description field in the Main tab matches the description for that payroll item in the Client Configuration screen of TimeWorksPlus. Accruable benefit balances in TimeWorksPlus are different than in Accounting CS. If the balances for an accruable benefit item are out of sync between the two applications, it could be because the description for the accruable benefit is not an exact match in each application. In Accounting CS, choose Setup > Accruable Benefits and make sure that the accruable benefit description in the Description field in the Main tab matches the description for that accruable benefit in the Client Configuration screen of TimeWorksPlus. Also, note that accruable balances do not show up in TimeWorksPlus until you have finalized a pay period in TimeWorksPlus.